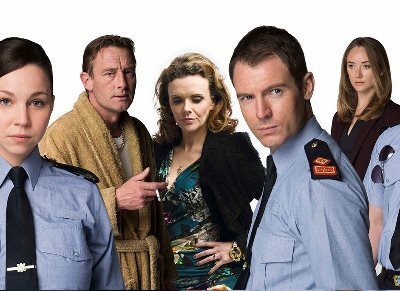 Red Rock, TV3's award-winning drama serial set around a busy garda station, comes to BBC daytime television this summer. TV3 chief Pat Kiely has described it as "one of the biggest export deals in the history of Irish broadcasting". Amazon Prime has also snapped up the series for €1.5 million. The first episodes will be shown on weekdays at 1.45 p.m. on BBC 1 starting on Monday, 11 July 2016. The soap opera was created by Peter McKenna, and its executive producers are Element’s Ed Guiney and former EastEnders executive producer John Yorke. SPOILER ALERT: the current season's finale on TV3 last month ended with a cliffhanger after Brian McGonigle was murdered. The killer will be revealed in an hour-long special episode on TV3 next September. The BBC will take up the storyline at the beginning of the first season, on the day a long-dormant feud is brutally reignited between two local families, the Hennessys and the Kielys. Dawn. A harbour town. The lights of Dublin in the distance. A grey fish factory. Seafront apartments. The main street peppered with To Let signs. The Ridge council estate, once a beacon of hope. Now battling age and neglect - and losing. Only a mile away, large detached houses. Sea views and four-wheel drives. Trawlers, swaying in oil-stained water. On the pier, an untidy pile of nets and brightly coloured buoys. Crimeire - Crime Fiction Ireland. Awesome Inc. theme. Powered by Blogger.